Michael Riedel says in his NYPost Column today that Vanessa Redgrave and her daughter Natasha Richardson are up for a revival of Sondheim's A Little Night Music at Roundabout next year. I'm just a tad disappointed that it may be Roundabout, which seems to make things ugly and cheap. On the other hand, the two fully staged productions I've seen were not exactly steeped in luxurious sets. And while it's not my dream casting, I have loved both Redgrave and Richardson in other things I've seen them in so it's not a total loss. It's sort of cool that they would play mother and daughter on stage too. And of course, it is Sondheim's most beautiful and transcendant work and therefore is practically failproof, no matter the sets and casting. At this point, I'll take just about whatever I can get. Wow, that is almost too good to be true. You are so lucky to be able to live in New York, not that it is all glamour filled with nights on the town, as a friend of mine who formerly lived there told me. 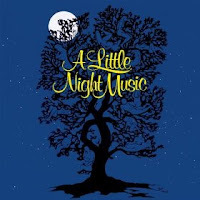 Nevertheless, though I would love to see if they issue another recording of "A Little Night Music" with this new cast anxiously skipping to "Every Day A Little Death," which is my favorite song of the musical, I still ahve to say that "Into The Woods" is my favorite Sondheim musical because it is more appropriate for families to attend, not to mention that it is sheer genius. Let us pray that Sondheim composes and lyricizes a new story for us soon, something atonal because his poetry seems to fit better with that musical structure. Hi Tyler, I guess your friend missed out because everyday in NYC is glamorous to me. As far as the family attendance thing, I'm not sure what your point is and I'm not sure I care. I want to be entertained and moved and taken to another place. All of the Sondheim's shows that I have seen have done that for me (except The Frogs!). Sweeney Todd is still my favorite Sondheim, but Follies and A Little Nights Music are absolutely glorious. Yes, excellent news! Not only was this one-night only production a month ago elegant and beautiful but the cast was brillant!